Here’s the premise for this post: I’m watching the Shanghai final after it already ended, and I’m aware of the result (but no other details about the match). However, I’m interested in seeing how things unfolded, so I’ll keep a log of my thoughts as I go through the final. Off we go! 1. Right off the bat, two crucial differences for Del Potro from his great semifinal showing against Nadal: 1) He’s started the match without a great 1st serve percentage and 2) He’s abandoned his very sound gameplan of constantly attacking the open court. No idea why he doesn’t think that would work against Djokovic (if that scheme is well executed, it will work against anyone). Instead, he’s settling in way too many backhand-to-backhand exchanges. The problem with this strategy is that Djokovic is burning him by going down-the-line with his own backhand. Also noteworthy: Djokovic’s backhand down-the-line is working quite well, unlike most of 2013. 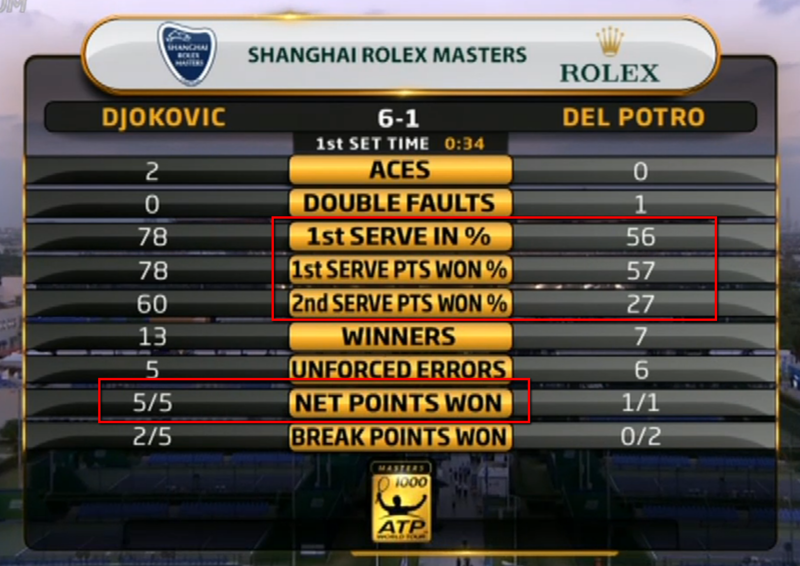 Two elements caused this disparity: 1) Delpo’s lack of 1st serves and 2) Djokovic’s excellent returns. The World No. 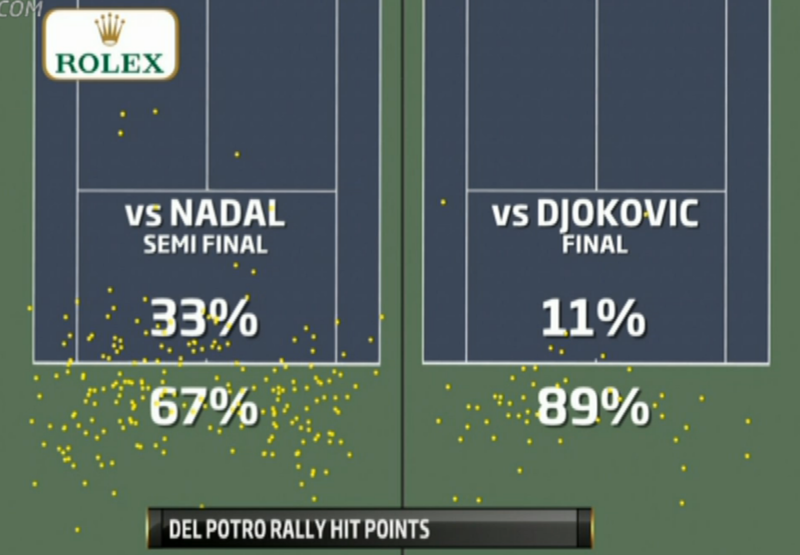 2 is making Delpo start most rallies from behind the baseline, taking away those early opportunities to attack. 3. You see how crucial it is for Delpo to find first serves when he’s trying to fend off bagel points at the end of the first set. He finds them, short returns come, and things become much simpler for the tall Argentine. 4. The first set is a near-flawless performance from Djokovic. He’s returned serve at a very high level, his tactics have been spot on, and his execution has been quite crisp. Not unlike the Beijing final, really. The highlight has been his backhand down-the-line. I don’t think he’s missed a single one, and most have gone on to win the point. That’s the shot that has helped Djokovic amass the lopsided head-to-head advantage against Del Potro over the years. Never a good sign for anyone. 7. The second game of the second set is one of the strangest things I’ve ever seen. Djokovic misses 3 simple forehands in a most bizarre way. We get slo-mo replays after two of them, and you can see that he lines up for the shot perfectly, seems to impact the ball correctly, and then his whole body gets discombobulated for no visible reason. I’ve seen Djokovic do this in the past, but never 3 times in the same game. He looks at his box, and even switches racquets mid-game. 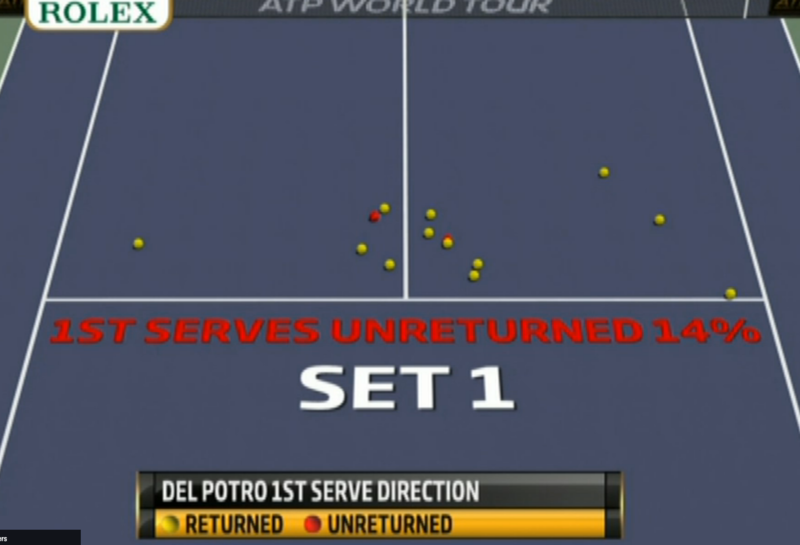 No matter: at 15-40, Delpo gets a great forehand cross-court return to catch the line, and he’s broken. Out of nowhere. 8. About that return on break point: Del Potro has been doing a great job of blasting CC FH returns off of one of Djokovic’s favorite serves: the slider out wide from the deuce court. He hits the returns fully out-streched, which is quite a sight to see. As a reminder, 3 of those came in the same game, they were all forehands, and they all had that weird discombobulation after impact. Moments later at 40-30, Djokovic adds another FH UFE to his count. 10. 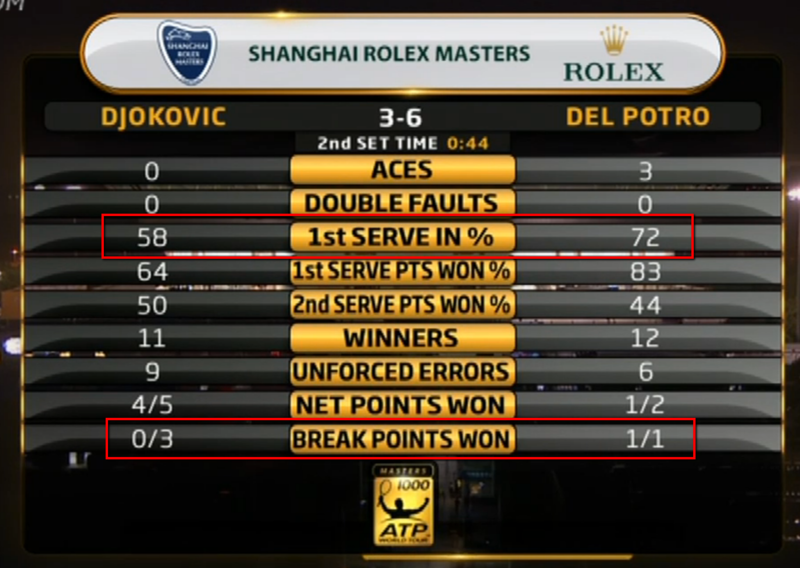 At 1-4, 15-all, another huge Delpo FH return off a decent slider out wide from the deuce court by Djokovic. This time, it goes for a clean winner DTL, and the Argie fans start chanting “Ar-gen-TINA! Ar-gen-TINA!” Later in the same game, Delpo brutalizes a FH to the tune of 161 kph. 11. At 4-2, 15-40, Djokovic has a huge chance to get back on serve. He hits a very good CC BH, has Delpo fully outstreched, but instead of hitting the ensuing approach shot behind Delpo, he chooses a BH DTL slice that lands short, which Delpo read perfectly. Result: Djokovic gets Roddicked. Novak’s reaction after the point ended seemed to indicate that he understood what the mistake was: you do not want to give Delpo a chance to do something spectacular with his forehand. That seems like a crucial game: Djokovic was up 0-40, but ends up losing 5 straight points. That second BP was the only one in which he had an actual chance, though: Delpo brought the service bombs for the other points. 12. Four first serves for Delpo at 5-3, and they translate into a simple love hold to take this match into a decider. Sometimes, tennis is that simple. In case you didn’t notice, Del Potro went from serving 56% 1st serves in the opening set, to 72% of 1st serves in the 2nd set. Couple that with Djokovic’s strange 1st service game of the set, plus Delpo’s clutch serving when down 0-40, and you get that set. Fascinating, no? It’s not only about hitting 1st serves – it’s about placing them near the lines. 15. 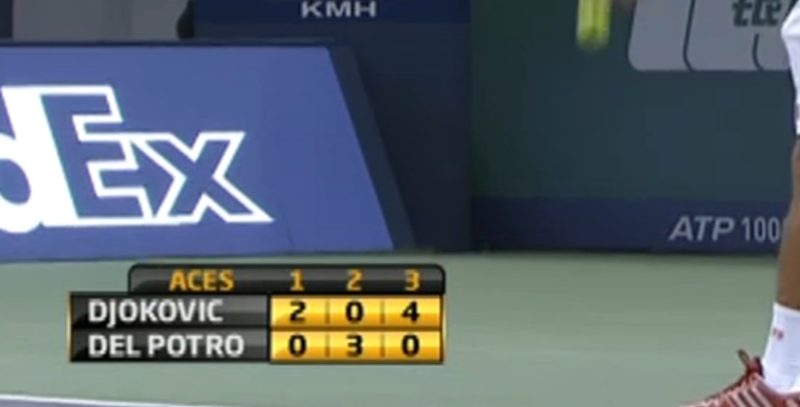 That CC BH UFE by Djokovic at 30-all, 1-2 in the second set is so very 2013. 17. As the set progresses, the match starts getting nervy. At 2-3, Djokovic wastes two very good returns, one at 15-40, the other at 30-40. In the first, he nets a 2nd ball FH that he seemed well in position to hit. In the second, he wastes a chance to attack with the second ball after the return, gets embroiled in a backhand-to-backhand exchange, never goes DTL, and then watches Del Potro take the initiative with a great inside-in forehand. Djokovic’s reaction? An angry kick to the board that contains the match time clock. Moments later, Delpo holds. 18. Subtlely, Delpo has gone back to his Nadal gameplan of attacking the open court with pace. Not surprisingly, it’s working. 19. Djokovic plays brilliant tennis to set up double-championship point at 4-5. And at 15-40, he botches a makeable 2nd serve return. 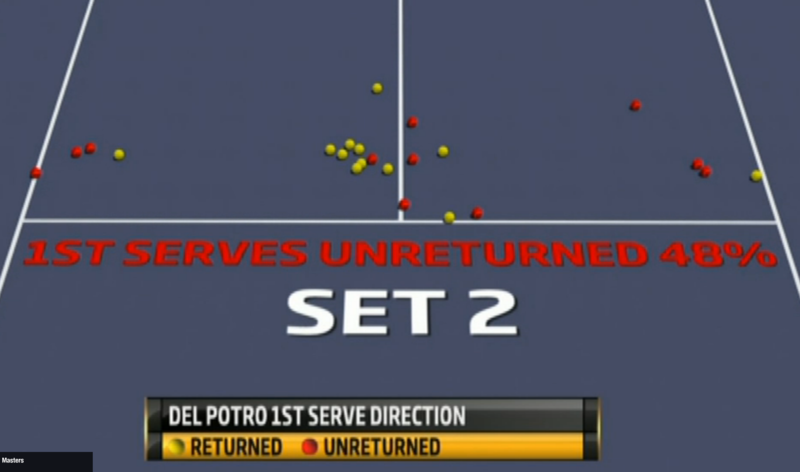 Let’s be clear – that was a very good 2nd serve by Delpo. It was fast, it was deep. However, Djokovic read it correctly, and was right there for the return. Just missed it. Not good enough for someone who’s made his millions by being extremely consistent at returning 2nd serves. Moments later, Djokovic gets annoyed at the crowd for the unspeakable crime of cheering Delpo’s great 1st serves. I will never understand why Djokovic gets so rattled by crowds. Why does he care what a random group of individuals he doesn’t know and will never meet thinks? It’s so freaking baffling. Elite athletes don’t care one bit about the crowd. They understand how fickle they are, and how they have no right to get in the way of their pursuit of greatness. There is no reason to let the crowd into your head. None. You’d think that someone of Djokovic’s experience had already figured this out. 20. Djokovic’s FH defense at 1-all in the tiebreaker is simply stunning. Nets him a minibreak, which he gives right back via a FH UFE off Delpo’s short return. The ensuing point at 2-all is simply masterful by Djokovic, in all facets of the game. As is the slice approach and drop volley to go up 5-3. And, of course, is the BH DTL winner to seal the match. A fitting end, since that shot worked particularly well in this match. Like last year, Djokovic found his best tennis at the best possible time. He didn’t have to save 5 match points this time, but he had to overcome a similarly excellent rival. Del Potro was extremely solid in the last two sets, and even though Djokovic had most of the chances to break in the third set, nobody watching this match would have pretended to know what was going to happen in that tiebreaker. Good point about how crowds apparently affect Djokovic. Federer was able to tame the crowd at Wimbledon in 2012 while Djokovic in 2013 could not. The same narrative was at work and Djokovic seemed to have acquiesced to it. Is it people pleasing at some level? Djokovic himself may be aware of it now. I find this statement to be quite unfair, harsh and to some extent, untrue. Why is there such a thing as home-court advantage if the crowds don’t play a role? Are soccer players not considered elite athletes? Yet, goals scored at home are weighted less than scored in their opponents field. I expected a sequel of that interesting analysis. There are a few stats I am interested in: the average speed of Djokovic’s shots, e.g. I noticed that stat in his match against Monfils, and it popped up also at the beginning of his match against DelPo. It seems that Novak played “faster” than both Monfils and JMDP, and that his shots travel faster in general. Another remark that should be checked: watching a few matches lately I had the impression that there was a lot more serves directed on the FH return. Of course, it is a bad strategy against DelPo. Although it seems that Novak has finally mastered that racquet and improved his FH, his placement for this shot is sometimes very strange. And while I think that he has improved his spin with this shot, I tend to believe that he still doesn’t hit it flat often enough. DelPo’s strategy in the first set was also unclear to me. Good analysis. What struck me about this match besides the brilliant tennis was Djokovic’s emotional outbursts, kicking the scoreboard, railing the crowds, gesticulations after missing. All signs of something in the background troubling Djokovic’s mind. Maybe he and others have underestimated the affect of losing number one ranking? Great to see a close match that both earned the right to hold the winning trophy.